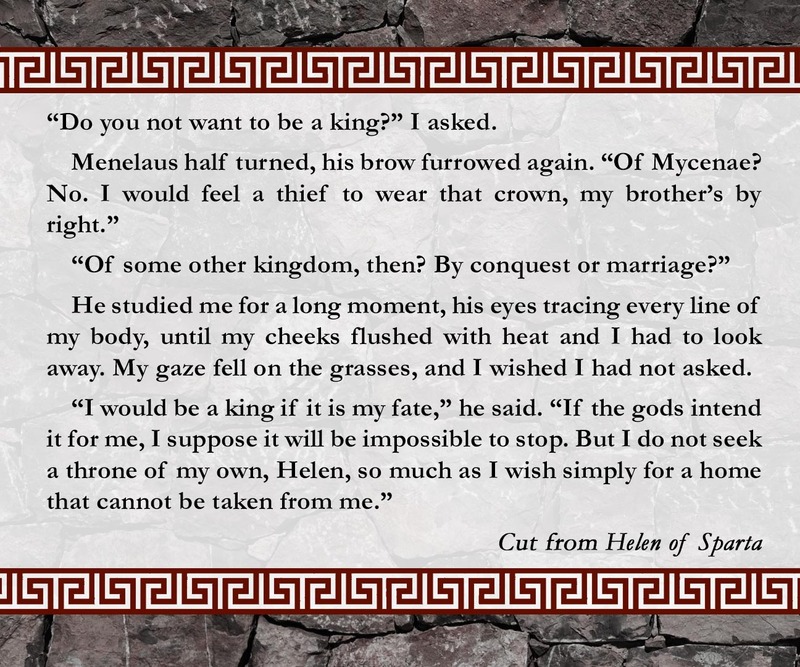 There are two characters in my Helen of Sparta books who kind of got short shrift after all the trimming and cutting and editing was done: Menelaus and Clytemnestra. I really wish I'd been able to give a little bit more space to both of them, on the page, but for pacing and other reasons, I just couldn't quite make it work. For both of them, the cuts that left them behind took place long before the book even reached my agent, never mind my publisher. 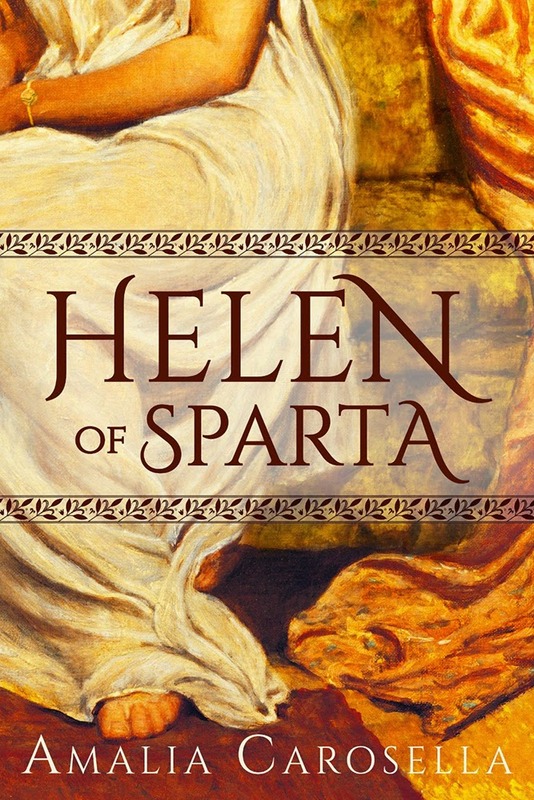 It was just part of the process of winnowing the book down to its core and finding its focus -- part of making Helen of Sparta a book about Helen and Theseus, rather than a book which addressed the entirety of Helen's story. For Menelaus, particularly, this meant losing part of his character arc and some smaller moments illustrating his relationship with Helen before he goes off to war at his brother's side to reclaim Mycenae. Exchanges that showed my own desire to see Menelaus as a hero -- because in spite of everything that happens in Helen of Sparta and By Helen's Hand (which I can't promise not to spoiler as I write this post, BEWARE! ), I don't think Menelaus himself ever wants to be anything else. I think he genuinely tried to be the love of Helen's life, and I don't think it's entirely his fault that he falls short. 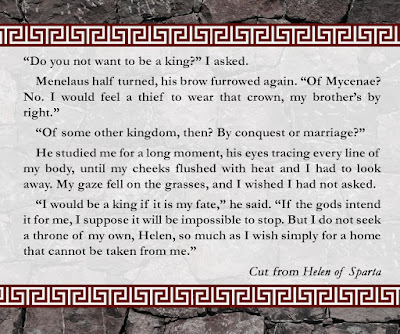 This is part of why I say that more than anything, these books are A story of Helen, not necessarily meant to be The Definitive story of Helen -- because the small changes I made to the myths in my retelling created ripples, and I think a great many of those ripples washed over Menelaus. The man who began as Helen's best friend, as the prime contender for Hero of the Story slowly started to change and shift beneath my fingers with every word written. Because each time Helen pushed her best friend away to save her people, each time she made the choice to fight against her fate, I realized that she was rejecting not just the demands of the gods, but also Menelaus himself. And how long could I expect Menelaus to endure that very personal (and very impersonal) rejection without being hurt by it? Without fighting back, grasping desperately to keep hold of the woman he loved? The woman he was fated to marry and lose? And this on top of what was already a clearly difficult relationship with his brother, Agamemnon -- the man who would later claim the title of High King and lead the great army of Greeks against the Trojans to reclaim Menelaus's own wife. The man who competed in his brother's place to win her at all. On top of an early life spent in exile from his own home. His own kingdom. How could the foundations of Menelaus's character not crack under so much pressure, so much strain? In the Odyssey, Menelaus cannot think about the Trojan War without incredible distress. Understandably, those events left their mark upon his psyche. Perhaps the war, the devastating losses broke him. I don't doubt that after the war, after he had won Helen back and found security in her affections at last, that he loved her. Maybe she loved him back, too. Maybe having suffered and survived those events together, they were bound to one another in ways they themselves didn't understand, and that was, at last, what united them completely. I'm inclined to believe that he loved her before the war, too. That he was devastated, too, by her loss -- stolen or abandoned, and he could not have known if she had gone willingly or been taken by force. I'm inclined to believe, too, that having Helen of Sparta as a wife was not all glory and sunshine and flowers. That the prize of her beauty had a cost. I'm inclined to believe that even for the best of men, knowing your wife inspires deep desire and overpowering lust in every other man who looks upon her -- and knowing intimately just how powerful those emotions are, as one entrapped by them as well -- is unlikely to be a foundation for a happy marriage or a peaceful union. And that's without all the rest of the complications and conflict embedded in the myths. So did I treat Menelaus harshly in my Helen of Sparta books? Perhaps. Perhaps I didn't give him as much credit as he deserved. Perhaps he was a better man, a stronger man. But I believe beyond a shadow of a doubt that even the strongest man could not have stood for long against the power of Helen. Only a fool seeks to hold a daughter of Zeus against her will. We're blogtouring May 16-June 24th to celebrate the release of BY HELEN'S HAND (Helen of Sparta #2) -- available NOW in paperback, audio (cd, mp3, and audible), and for kindle. I hope you'll join us by sharing your own reviews on Amazon, Goodreads, or wherever you like to talk books! And if you enjoyed my take on Helen, don't forget to subscribe to THE AMALIAD for a free short story prequel to HELEN OF SPARTA: Ariadne and the Beast! By Helen's Hand Blog Tour Begins Now! By Helen's Hand has Arrived!!! Audiobook Giveaway for By Helen's Hand!